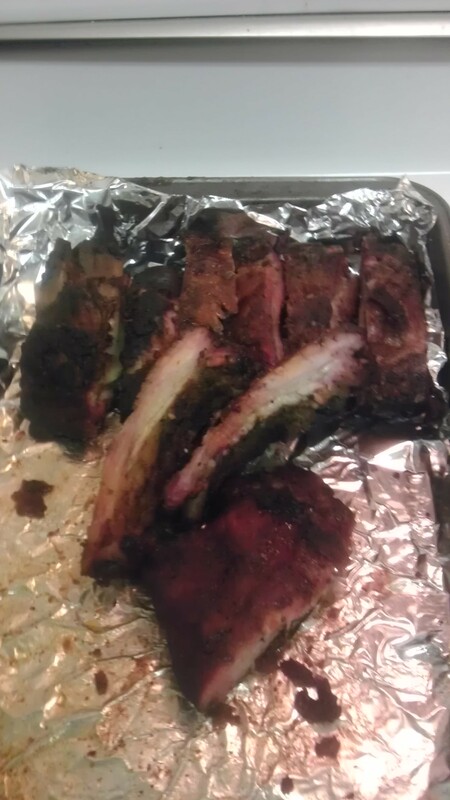 Anywho, I got my ribs ready by removing the membrane on the back of both slabs, dusted with salt, pepper, garlic powder, brown sugar and then squeezed a little yellow mustard on them, drizzled a very little bit of molasses and finished off with a dash or 3 of Lea and Perrins. Then I rubbed it in good and let them sit for an hour. I split the chicken and sprinkled it with Tony C’s seasoning and let it sit, too. 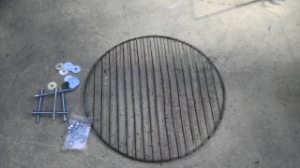 I started my pit using my IQ110 again and the Smokenator. Low and slow at 225 degrees F. I was determined to do the 3-2-1 method with the ribs. 3 hours in the smoke, then wrap in foil with a little liquid, 2 hours on the smoker, unwrap and brush with sauce and a final 1 hour on the pit. I put my chicken on after the 3 hours and let it go until the ribs were done. The ribs came out great! The chicken? Wellll, it took a bit longer to cook. Quite a bit longer. I have come to the conclusion that trying to do chicken halves like my Dad did is not gonna work for me. I had the thermometer in the chicken but it wasn’t going to go over 160. I ended up cutting the chicken up into 8 pieces and finishing it on the pit. 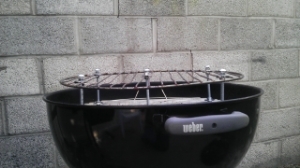 One thing new that I tried was using my 2 level cooking on the Weber Silver. 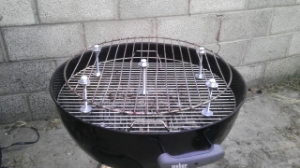 Remember I showed how I used another grill and some bolts and washers to make a grill that sits about 3-4 inches above the regular grill? 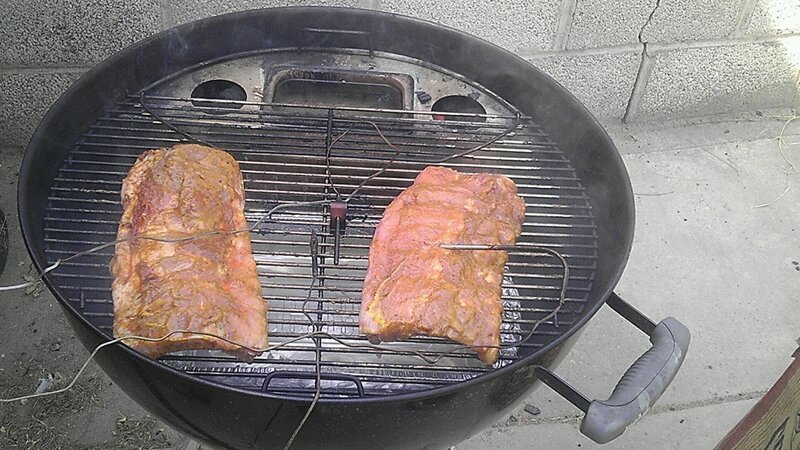 I did the ribs on the top for the first 3 hours, measuring the temp on the top grill, set to 225. I can get 2 full slabs of ribs on the bbq now. After the 3 hours, I wrapped the ribs and put them on the top grill. 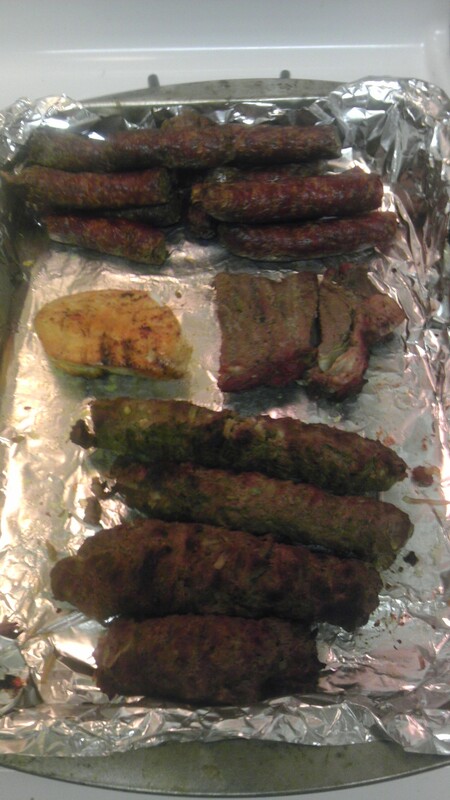 I laid the 2 chicken halves out on the bottom grill and let them go for 2 hours. Yep, 2 full slabs of ribs and 2 chicken halves on a Weber Silver. Yeehaw! After the 2 hours, the chicken was barely brown. Bummer. I unwrapped the ribs and put them on the bottom and the chicken on the top. I measured the temp on the bottom grill and it was almost 30 degrees cooler than on the top grill. Drat! 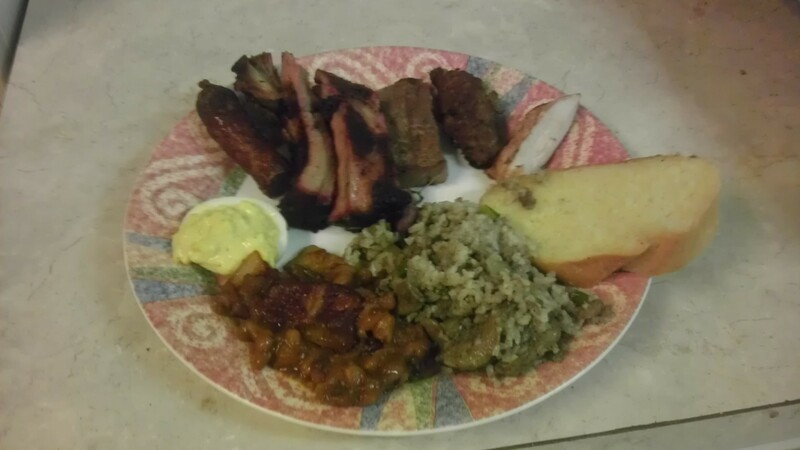 Anywho, after an hour, the ribs were done, but the chicken wasn’t. I fought it for another 1/2 hour and then said to heck with the halves and split them up. It took another 30 minutes for it to get to 165 with them on the top grill. Along with the ribs and chicken, I did some fresh corn on the cob in the microwave. I whacked off the bottom (nope, didn’t shuck it or anything), then put 3 ears in the microwave for 9 minutes. When the microwave dinged, I took them out (using oven mitts!) and squeezed the top hard. They just slid out of the husks,silk all left behind. Great way to do corn! I finished off with some dirty rice. Yep, we feasted. Tonight, I’m in Chicago and just finished a couple of pieces of deep dish pizza from Giordano’s. OMG! That stuff is awesome!